Ever wondered how to use social media for business but been too scared to ask? A Honiton based digital agency has launched an innovative way to ask questions and receive help and support online from local experts. 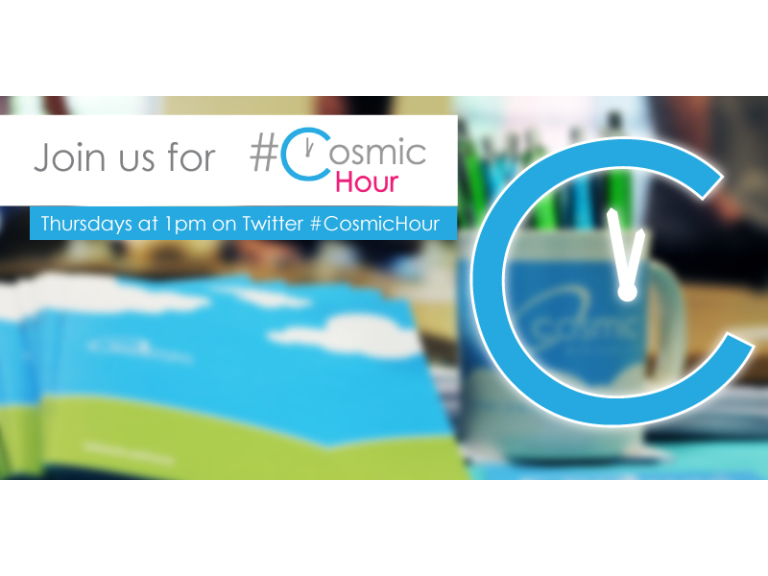 #CosmicHour is an hour on Twitter during which anyone can ask questions about websites, digital marketing and basic technical support. ‘#CosmicHour’ will begin on Thursday 15th October at 1pm and continue every week at the same time. As a social enterprise this will become an integral part of Cosmic’s social impact to offer support via Twitter to any organisation or individual who has questions or needs hints and tips to get started online. Although support is provided via Twitter all week long, these focussed support hours will be specific times to share your experiences and ideas with other organisations who need support online. As well as asking questions to the experts at Cosmic. Cosmic aim that #CosmicHour will become a great asset to the local digital economy in supporting organisations to do more with their digital marketing. Cosmic hope that #CosmicHour will develop into a community where organisations of all shapes and sizes from across the South West can contribute their experiences and advice to those starting up and mutually benefit from the networking opportunities this provides. Often networking via social media channels such as Twitter is difficult because of the lack of connection between organisations but advice and support is something that everyone can ask for or contribute to. To get involved in #CosmicHour all you need to do is log into Twitter and search the term ‘#CosmicHour’, once you can see the hashtag feed then you can contribute by asking questions and sharing your experiences while digital marketing experts answer your questions and give you hints and tips to progress your digital ability. An example of the types of questions we’ll be answering is “How can I make Twitter work for my business? #CosmicHour”. We’ve also included a helpful guide to making the most of #CosmicHour. Cosmic offers web design, tech support, digital marketing and training, whilst at the same time focusing on digital inclusion projects as its key social objective. Based in Honiton, Devon and delivering its services across the South West, Cosmic is often cited regionally, nationally and internationally as an exemplar social enterprise and digital business. Having delivered IT and digital services for over 17 years now, Cosmic is a very well recognised and respected local business, providing support, advice, training and policy input for the local business community. In recent years we have been very keenly developing our business model in order to achieve sustainable growth at the same time as delivered key social impact in specific areas. Cosmic is a social enterprise, which means that the profits of our business are invested in the community to help make the benefits of living in a digital world available to everyone.